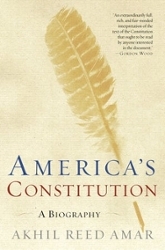 “In America’s Constitution, one of this era’s most accomplished constitutional law scholars, Akhil Reed Amar, gives the first comprehensive account of one of the world’s great political texts. Incisive, entertaining, and occasionally controversial, this “biography” of America’s framing document explains not only what the Constitution says but also why the Constitution says it. "We all know this much: the Constitution is neither immutable nor perfect. Amar shows us how the story of this one relatively compact document reflects the story of America more generally. (For example, much of the Constitution, including the glorious-sounding “We the People,” was lifted from existing American legal texts, including early state constitutions.) In short, the Constitution was as much a product of its environment as it was a product of its individual creators’ inspired genius. "Despite the Constitution’s flaws, its role in guiding our republic has been nothing short of amazing. Skillfully placing the document in the context of late-eighteenth-century American politics, America’s Constitution explains, for instance, whether there is anything in the Constitution that is unamendable; the reason America adopted an electoral college; why a president must be at least thirty-five years old; and why–for now, at least–only those citizens who were born under the American flag can become president. "From his unique perspective, Amar also gives us unconventional wisdom about the Constitution and its significance throughout the nation’s history. For one thing, we see that the Constitution has been far more democratic than is conventionally understood. Even though the document was drafted by white landholders, a remarkably large number of citizens (by the standards of 1787) were allowed to vote up or down on it, and the document’s later amendments eventually extended the vote to virtually all Americans. "We also learn that the Founders’ Constitution was far more slavocratic than many would acknowledge: the “three fifths” clause gave the South extra political clout for every slave it owned or acquired. As a result, slaveholding Virginians held the presidency all but four of the Republic’s first thirty-six years, and proslavery forces eventually came to dominate much of the federal government prior to Lincoln’s election. Amar, Akhil Reed. America’s Constitution: A Biography. Random House, 2006. The United States Declaration of Independence is the statement adopted by the Second Continental Congress on July 4, 1776, which announced that the thirteen American colonies regarded themselves as thirteen independent sovereign states. The sources and interpretation of the Declaration have been the subject of much scholarly inquiry. The Declaration justified the independence of the United States by listing colonial grievances against King George III, and by asserting certain natural and legal rights, including a right of revolution. The Articles of Confederation was an agreement among the 13 original states of the United States of America that served as its first constitution. The Articles formed a war-time confederation of states, with an extremely limited central government. While unratified, the document was used by the Congress to conduct business, direct the American Revolutionary War, conduct diplomacy with foreign nations, and deal with territorial issues and Native American relations. The United States Constitution is the supreme law of the United States. The Constitution, originally comprising seven articles, delineates the national frame of government. Since the Constitution came into force in 1789, it has been amended 27 times. In general, the first ten amendments, known collectively as the Bill of Rights, offer specific protections of individual liberty and justice and place restrictions on the powers of government. The majority of the seventeen later amendments expand individual civil rights protections. Others address issues related to federal authority or modify government processes and procedures. The Federalist Papers is a collection of 85 articles and essays written under the pseudonym "Publius" by Alexander Hamilton, James Madison, and John Jay to promote the ratification of the United States Constitution. According to historian Richard B. Morris, they are an "incomparable exposition of the Constitution, a classic in political science unsurpassed in both breadth and depth by the product of any later American writer. In Democracy in America, Alexis de Tocqueville examines the democratic revolution that he believed had been occurring over the previous several hundred years. In 1831, Tocqueville and Gustave de Beaumont were sent by the French government to study the American prison system. In his later letters Tocqueville indicates that he and Beaumont used their official business as a pretext to study American society instead. They arrived in New York City in May of that year and spent nine months traveling the United States, studying the prisons, and collecting information on American society, including its religious, political, and economic character. “In a classic work, Samuel P. Huntington challenges most of the old assumptions and ideas on the role of the military in society. Stressing the value of the military outlook for American national policy, Huntington has performed the distinctive task of developing a general theory of civil–military relations and subjecting it to rigorous historical analysis. "Part One presents the general theory of the “military profession,” the “military mind,” and civilian control. Huntington analyzes the rise of the military profession in western Europe in the eighteenth and nineteenth centuries, and compares the civil–military relations of Germany and Japan between 1870 and 1945. "Part Two describes the two environmental constants of American civil-military relations, our liberal values and our conservative constitution, and then analyzes the evolution of American civil-military relations from 1789 down to 1940, focusing upon the emergence of the American military profession and the impact upon it of intellectual and political currents. 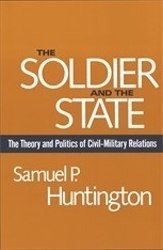 Huntington, Samuel P. The Soldier and the State: The Theory and Politics of Civil-Military Relations. Belknap Press, 1981. Janowitz, Morris. 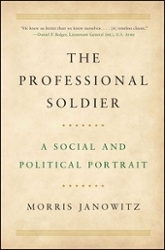 The Professional Soldier: A Social and Political Portrait. Simon & Schuster, 2017. 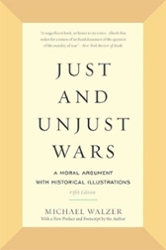 Just and Unjust Wars: A Moral Argument with Historical Illustrations, 5th ed. Walzer, Michael. Just and Unjust Wars: A Moral Argument with Historical Illustrations, 5th ed. Basic Books, 2015. 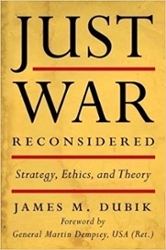 Dubik, James M. Just War Reconsidered: Strategy, Ethics, and Theory. University Press of Kentucky, 2016. The Old Testament is the first part of Christian Bibles based primarily upon the Hebrew Bible (or Tanakh), a collection of ancient religious writings by the Israelites believed by many Christians and religious Jews to be the sacred Word of God. (Old Testament) The Book of Proverbs is the second book of the third section (called Writings). Proverbs is a "collection of collections" relating to a pattern of life. It is an example of the Biblical wisdom tradition, and raises questions of values, moral behavior, the meaning of human life, and right conduct. The Torah is the central reference of Judaism. It most specifically means the first five books (Pentateuch) of the 24 books of the Tanakh, and it usually includes the rabbinic commentaries (perushim). Torah consists of the origin of Jewish peoplehood: their call into being by God, their trials and tribulations, and their covenant with their God, which involves following a way of life embodied in a set of moral and religious obligations and civil laws (halakha). The I Ching is an ancient Chinese divination text and the oldest of the Chinese classics. Possessing a history of more than two and a half millennia of commentary and interpretation, the I Ching is an influential text read throughout the world, providing inspiration to the worlds of religion, psychoanalysis, business, literature, and art. The Noble Eightfold Path is an early summary of the path of Buddhist practices leading to liberation from samsara, the painful cycle of rebirth. It consists of eight practices: right view, right resolve, right speech, right conduct, right livelihood, right effort, right mindfulness, and right samadhi ('meditative absorption or union'). The Eightfold Path teaches that by restraining oneself, cultivating discipline, and practicing mindfulness and meditation, house-leavers (monks and nuns) attain nirvana and stop their craving, clinging and karmic accumulations, thereby ending their rebirth and suffering. The Republic is a Socratic dialogue concerning justice, the order and character of the just city-state and the just man. It is Plato's best-known work and has proven to be one of the world's most influential works of philosophy and political theory, both intellectually and historically. The Nicomachean Ethics is the name normally given to Aristotle's best-known work on ethics. The work, which plays a pre-eminent role in defining Aristotelian ethics, consists of ten books, originally separate scrolls, and is understood to be based on notes from his lectures at the Lyceum. The Nicomachean Ethics is widely considered one of the most important historical philosophical works, and had an important impact upon the European Middle Ages, becoming one of the core works of medieval philosophy. It therefore indirectly became critical in the development of all modern philosophy as well as European law and theology. Politics is a work of political philosophy divided into eight books, which are each further divided into chapters. The end of the Nicomachean Ethics declared that the inquiry into ethics necessarily follows into politics, and the two works are frequently considered to be parts of a larger treatise, or perhaps connected lectures, dealing with the "philosophy of human affairs. The Bhagavad Gita is a 700 verse Hindu scripture in Sanskrit that is part of the Hindu epic Mahabharata (chapters 23–40 of the 6th book of Mahabharata). The Bhagavad Gita presents a synthesis of the concept of Dharma, theistic bhakti, the yogic ideals of moksha through jnana, bhakti, karma, and Raja Yoga, and Samkhya philosophy. The New Testament is the second part of the Christian biblical canon based on the Hebrew Bible. The New Testament discusses the teachings and person of Jesus, as well as events in first-century Christianity. Christians regard both the Old and New Testaments together as sacred scripture. The New Testament has influenced religious, philosophical, and political movements in Christendom and left an indelible mark on literature, art, and music. The Enchiridion or Manual of Epictetus is a short manual of Stoic ethical advice compiled by Arrian, a 2nd-century disciple of the Greek philosopher Epictetus. Although the content is similar to the Discourses of Epictetus, it is not a summary of the Discourses but rather a compilation of practical precepts. Eschewing metaphysics, Arrian focused his attention on Epictetus's work applying philosophy in daily life. The primary theme is that one should accept what happens. The Quran is the central religious text of Islam, which Muslims believe to be a revelation from God (Allah). It is widely regarded as the finest work in classical Arabic literature. The Quran is divided into chapters (surah in Arabic), which are then divided into verses (ayah). Muslims believe that the Quran was verbally revealed by God to Muhammad through the angel Gabriel (Jibril), gradually over a period of approximately 23 years. Muslims regard the Quran as the most important miracle of Muhammad, a proof of his prophethood, and the culmination of a series of divine messages that started with the messages revealed to Adam and ended with Muhammad. Meditations is a series of personal writings by Marcus Aurelius, Roman Emperor from 161 to 180 AD. He wrote the 12 books of the Meditations in Koine Greek as a source for his own guidance and self-improvement. They’re his private notes to himself and ideas on Stoic philosophy and take the form of quotations varying in length from one sentence to long paragraphs. Written during the turmoil of the English Civil War, Leviathan is an ambitious and highly original work of political philosophy. Claiming that man's essential nature is competitive and selfish, Hobbes formulates the case for a powerful sovereign—or "Leviathan"—to enforce peace and the law, substituting security for the anarchic freedom he believed human beings would otherwise experience. This worldview shocked many of Hobbes's contemporaries, and his work was publicly burnt for sedition and blasphemy when it was first published. But in his rejection of Aristotle's view of man as a naturally social being, and in his painstaking analysis of the ways in which society can and should function, Hobbes opened up a whole new world of political science. John Locke argued that political societies exist to defend the lives, liberties and properties of their citizens and that no government has any authority except by the consent of the people. When rulers became tyrants and act against the common good, then the people have the right of revolution against them. The rights of property– owners, of Native Americans, and of women and children, the need for economic improvement, the separation of commands, and the nature and limits of consent—these are all topics within Locke's compass and make this book the subject of intense debate. Sparked by Thoreau’s outrage at American slavery and the American-Mexican war, Civil Disobedience is a call for every citizen to value his conscience above his government. Within this 19th century essay, Thoreau explains government of any sort – including democracy – does not possess more wisdom or justice than its individual citizens, and that it is every citizen’s responsibility to avoid acquiescence. More than an essay, Civil Disobedience is a call to action for all citizens to refuse to participate in, or encourage in any way, an unjust institution. On Liberty is a philosophical work by the English philosopher John Stuart Mill, originally intended as a short essay. Mill attempts to establish standards for the relationship between authority and liberty and criticizes the errors of past attempts to defend individuality where democratic ideals resulted in the "tyranny of the majority". Among the standards established in this work are Mill's three basic liberties of individuals, his three legitimate objections to government intervention, and his two maxims regarding the relationship of the individual to society. John Stuart Mill argues for representative government, the ideal form of government in his opinion. Mill puts forth that the business of government representatives is not to make legislation. Instead, he suggests that representative bodies such as parliaments and senates are best suited to be places of public debate on the various opinions held by the population and to act as watchdogs of the professionals who create and administer laws and policy. The Summa Theologiae is the best-known work of Thomas Aquinas. It was intended as an instructional guide for theology students, including seminarians and the literate laity. It was a compendium of the main theological teachings of the Catholic Church. It presents the reasoning for almost all points of Christian theology in the West. The Summa's topics follow a cycle: the existence of God; Creation, Man; Man's purpose; Christ; the Sacraments; and back to God.